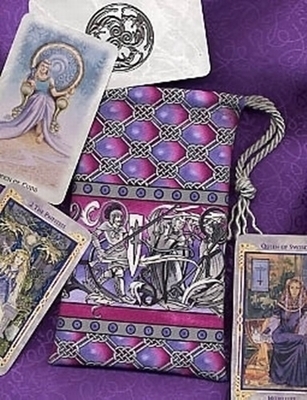 The lords and ladies of Arthurian legend inhabit the Morgan LeFey Tarot Bag. 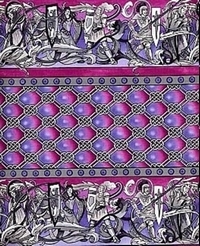 Morgan Le Fey, Lady Guinevere, King Arthur, Sir Lancelot, Sir Galahad, and other nobles of the court, are interlaced with leafy scrollwork in a magical purple and magenta toned pattern. 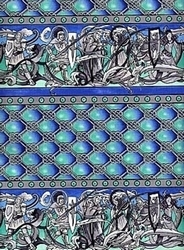 Elegant Celtic knotwork forms a border above and below. 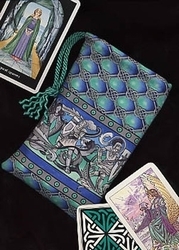 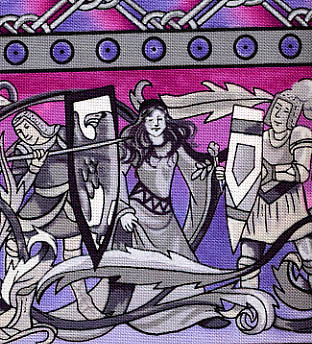 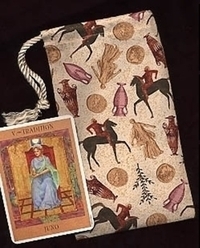 Deck suggestions: Illustrations depicting the age of legend & chivalry adorn this lovely fabric, creating a special home for a tarot deck with a similar theme such as the Legend Tarot, Celtic Dragon Tarot, the Spiral Tarot, the Celtic Tarot or the Connolly Tarot.